- In the critical animation, there is no crouching sprite though there should be. You'll have to edit the sword out of the crouching sprite from regular attack to remedy this. - The first sprite of the dodge animation is the old standing sprite. Just use the one with the regular attacking animation. 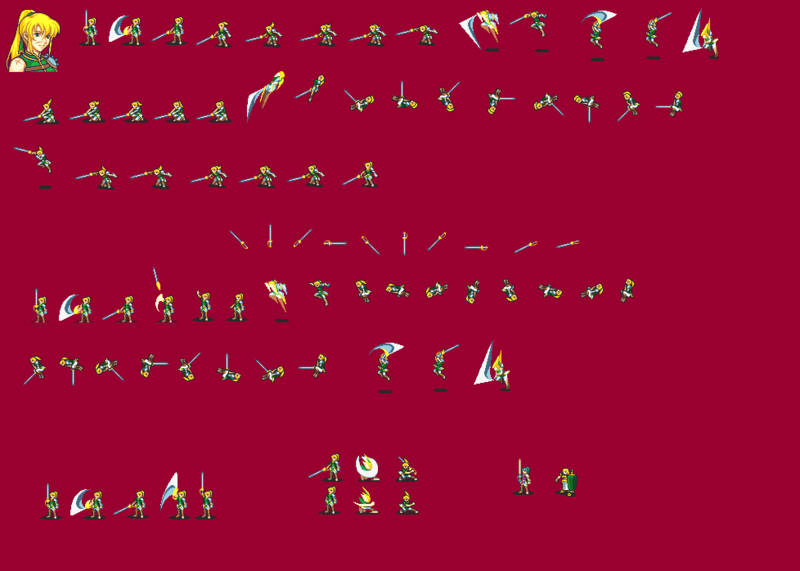 You can edit the animation to be exactly like a male mercenary's attack, since the sprites are all there, but that's on you. Free to use (as if anyone would want to) and edit. I don't care about credit, just don't try to claim as your own. Interests:FE, Final Fantasy, spriting, bunch of other stuff. Looks pretty cool. Doesn't really seem like a mercenary though, but more like a sword recruit/dismounted sword pegasus knight. May I edit and script it? I don't think I'll end up using it (I never know, I may) but it seems really cool so I want to make it into a rom hack insert able animation. It's really cool but like Astra said it kinda doesn't look like a merc, maybe if you made the sword thicker? I don't know but it still looks really cool. Anyone can edit it, and it's free to use! Technically, there was a Female Mercenary in GhebSaga, it was lazily made, not saying it was bad, but it was greatly executed. Interests:Things not related to school. Except English and art. Possibly history as well. That turned out quite well. I actually could tell that it was Lyn, Eirika, Rogue, etc., but the different sources actually went together smoothly. Whenever I sprite animations, it usually ends up animating too choppy. jboney93: Not very much, cause girls don't tend to try to sing much higher in pitch than they can talk. Agent Ryru: But on the other hand even I would have to admit said game could be awesome.